The name “nighthawk” is a bit of a misnomer because this species is not a hawk and is most active at dawn and dusk, not at night. Its distinctive bouncy, erratic flight is a familiar sight over urban areas and lighted ball fields on summer evenings. This flight pattern may have reminded some of a large bat, hence the local name “bullbat.” Nighthawks breed to the northern limit of forest in Canada, throughout the United States and south to Honduras. 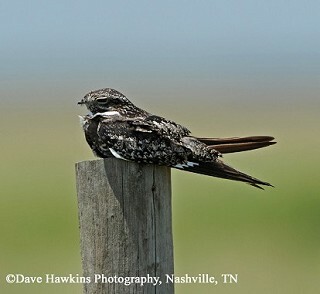 The Common Nighthawk has among the longest migrations of any North American bird, wintering entirely in South America. Description: This medium-sized bird has a large head, a tiny, but wide bill, and its camouflaged brown mottled plumage makes it difficult to observe at rest. In flight, wings are long, pointed, and bent, with a prominent white patch near the tip. Sexes are similar in plumage, but female have a smaller white wing patch, and lack the small white tail stripe of male. Voice: A nasal, buzzy peent, heard at dawn and dusk, often while foraging. Chuck-will’s-widow and Whip-poor-will has larger heads, rounded tails, and long rounded wings with no white patches. Habitat: Breeds in areas with exposed gravel or soil and few trees, and commonly on gravel rooftops. In Middle Tennessee, they are commonly found in cedar glades. Nesting and reproduction: During the breeding season, the male makes a spectacular “booming” dive both during courtship and for territorial defense. The male swoops down to within a few feet of the ground making a large sound as the wind vibrates through its flight feathers. Incubation: The female incubates for 19 days. Fledging: Both the female and male feed regurgitated insects to their chicks. Young begin flying at 23 days and remain dependent on adults for another week. Nest: Eggs are laid directly on the ground, on gravel roofs, exposed rock in cedar glades, in pastures, or in plowed fields. No nesting material is used. Status in Tennessee: The Common Nighthawk is a fairly common summer resident across the state. It is present from late April through early October and is sometimes seen in large flocks during fall migration. Populations have declined in recent years. Researchers have documented over 500 mosquitoes in the stomachs of individual Common Nighthawks. The Common Nighthawk belongs to the Goatsucker Family, found in the Old and New World. This name is based on an ancient belief that these birds fed on goats' milk at night. The oldest known Common Nighthawk in the wild was 10 years old. Best places to see in Tennessee: This bird can be see over most large urban areas, and many lighted ball fields across the state in summer. In summer, dozens may be seen flying through the lights over the pedestrian bridge by the football stadium in Nashville. Poulin, R. G., S. D. Grindal, and R. M. Brigham. 1996. Common Nighthawk (Chordeiles minor). The Birds of North America, No. 213 (A. Poole and F. Gill, eds.). The Academy of Natural Sciences, Philadelphia, PA, and The American Ornithologists' Union, Washington, D.C.